US drone companies historically have had trouble taking off. But two American startups think they may have created the innovations that will give them a foothold to compete with Chinese powerhouse DJI, which has faced data security questions. Impossible Aerospace, a Silicon Valley-based startup founded by Tesla (TSLA) and SpaceX veterans, announced Monday it's selling a drone with two hours of flight time to fire departments, police departments and search and rescue teams. It's a significant advancement considering most drones typically get about 30 minutes in the air on a single charge. Another startup, Skydio now makes a drone that autonomously follows its users and avoids obstacles in its path, a feat competitors haven't matched. Last week it launched new cinematic features to better record these videos. Impossible Aerospace and Skydio need every edge against DJI, the worldwide leader in drones. DJI, which reported $2.7 billion in revenue last year, is best known for its popular Phantom drone. Introduced in 2013, the drone is most popular commercial drone on the market. It can be used for everything from roof inspections to search and rescue operations. The price point sets it apart: at $1,500, it packs in advanced features such as precise hovering and live video streaming. DJI is so prolific that it's essentially chased away competitors. Earlier this year, GoPro quit the drone market, citing competitive concerns. Meanwhile, 3DR, another American drone company, stopped selling its drone last year. Although it's been an uphill battle for American drone companies, Impossible Aerospace CEO Spencer Gore isn't worried. "People say American drone companies can't be competitive because it's hard to manufacture a product here," Gore told CNNMoney. "I would say it's the exact opposite. I don't think they were American enough." Impossible Aerospace will engineer and assemble its drones in the country, breaking from the trend of US tech companies manufacturing overseas. Gore, who previously worked as a battery engineer at Tesla, saw firsthand the benefits of a company manufacturing a product alongside its engineers. He said the proximity makes employees more accountable to each other and boosts innovation. Skydio makes its drone in Redwood City, Calif.
His hardware team, many of whom came from Tesla, has US manufacturing experience. Skydio is taking a similar approach. It makes the R1 drone in California, according to CEO Adam Bry. Impossible Aerospace's drone starts at $7,500. Skydio's R1 goes for $1,999. 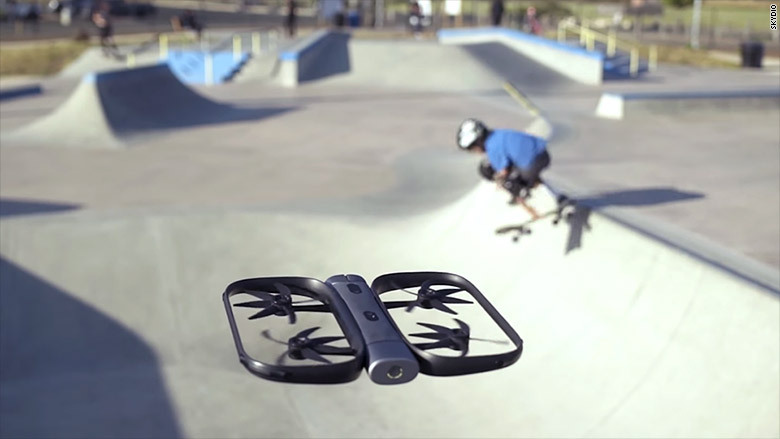 The Skydio R1 autonomously follows its subjects and shoots video. The companies have another edge on DJI, too: the Chinese company has raised national security concerns. In 2017, the US Army issued a ban on using DJI drones. A government memo alleged the company shared critical infrastructure and law enforcement data with the Chinese government. DJI denied the claim and hired a forensic investigator, which showed that data transmissions to remove servers could be turned off. But US government agencies never lifted restrictions on DJI drones. The ban came as US agencies rapidly expanded their use of drones, leaving some scrambling to find enough American drones. "We probably cornered the worldwide inventory of 3DR's Solo drone," Mark Bathrick, who oversees drone programs at the Department of the Interior, told CNNMoney. Bathrick said he needs a replacement for the aging and discontinued Solo, which has created an opportunity for other American companies. The US Department of the Interior embraces drones because they're inexpensive -- generally costing about a few hundred dollars each -- to operate and sub in for humans in dangerous roles. His department flew nearly 5,000 drone missions in 2017, up from 750 in 2016. "There isn't a commercial application for drones that I'm aware of that we haven't done or don't plan to do," he said. Bathrick envisions using drones for dropping explosive charges to prevent avalanches and rescuing people in dangerous situations. His team is currently experimenting with two DJI drones, including one on a wildfire prevention mission. They're using a DJI Matrice 600 to drop flammable ping pong balls over a forest. It can carry a heavy payload, making it suited for the job. Traditionally, the department flew helicopters above the treeline for the treacherous mission. But in the past 13 years, two helicopters crashed, killing five people. Government partners, including NASA, the Department of Homeland Security and Defense Department, are working to confirm if new, specialized drones from DJI meet data security standards. Bathrick hopes for a final decision by the end of the year. 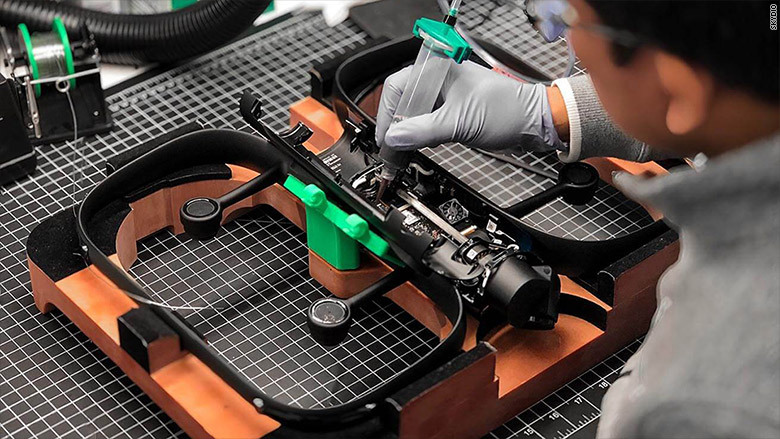 DJI said it's eager to work with companies with sensitive needs and realized its products must be better customized. 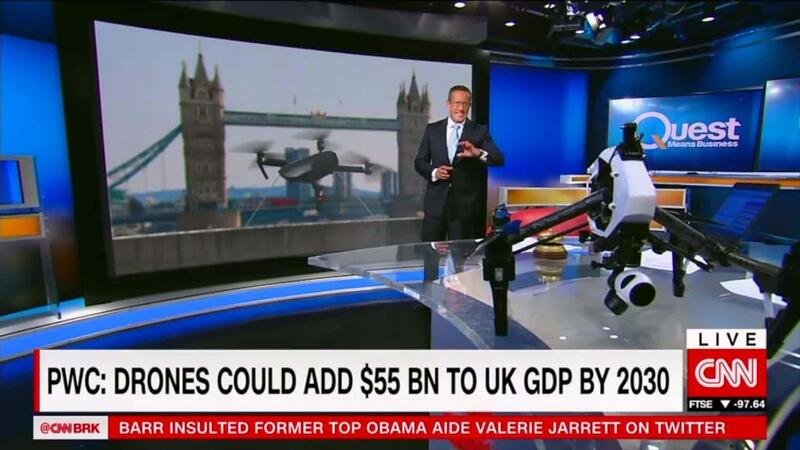 "It was a lesson learned for us," DJI vice president for North America Mario Rebello told CNNMoney. "In the past year, we've learned the importance of engaging with our customer base, working with our partners and developers to make sure we're addressing the data security and data management issues."